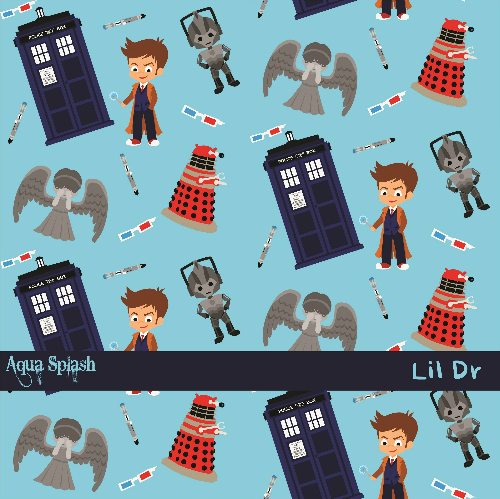 I found some adorable Dr. Who fabric from Aqua Splash Customs. I bought a couple yards with the intention of making a lady skater out of it. I made it, but I'm not super happy with it. 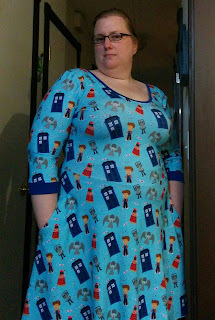 I think it looks a little like pajamas instead of a cute dress to wear to work. 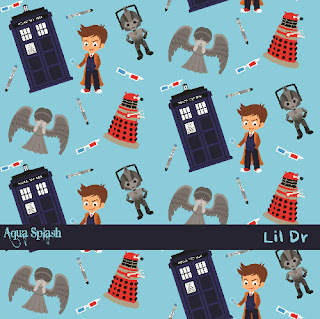 I shouldn't have made the entire thing out of that fabric. I think I would have been better off only using it as an accent. 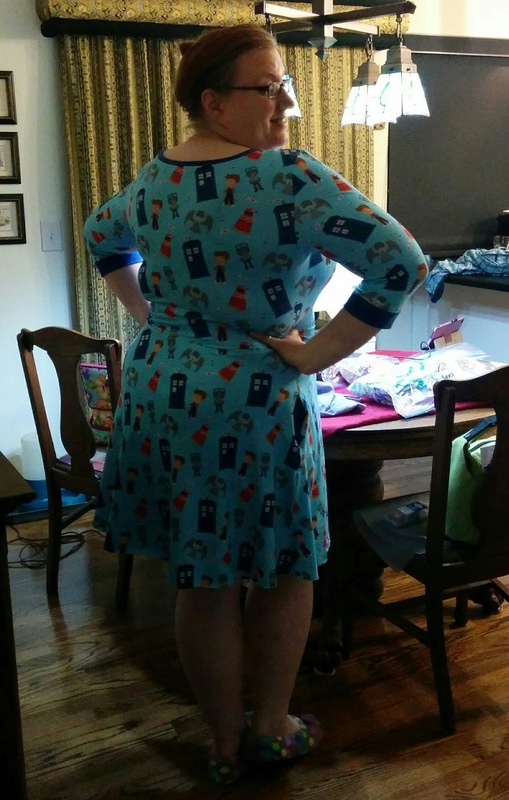 I didn't really have enough fabric to do proper pattern matching either and its bugging me. I thought I had cut the front to match up better, but apparently not. I'll still wear it like it is, especially to PAX, but I'd like to try to figure out a way to make it less annoying to me. If anyone has any ideas, I'd love to hear them. I have some more of the blue I used for the neck and arm bands, but I don't have much. Although, it's the blue I bought at JoAnn's for my Pride dress, so they likely still have it. I think it's the blue bands that make it look like pajamas. I would cut those off and hem the sleeves plainly. Then I would make the neckline into a sweetheart neckline, and wear the dress with a blue patent leather belt. I think you will find it doesn't look like pajamas anymore then. I think you are right about the bands. 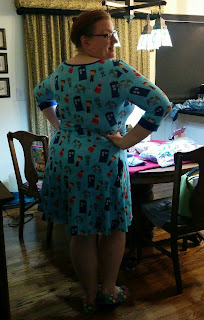 And I was thinking of doing something to hide the ugly waist seam. I really don't like wearing belts, especially with dresses. I have pretty much zero waist and so when I wear belts and then sit down, my body mass redistribution ends up making the belt too tight or it flips down. So I'm just constantly fussing with it. What about throwing on a cardigan or blazer? Love that you could wear this to work. 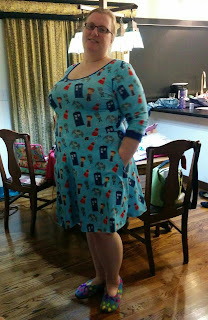 I just made a Vader dress to wear to comic con sorts of events and the opening of star wars. So delightful. I think it's really cute and looks adorable on you. The arm bands do give a slight pj feel. This may be a lot of work, but what if, instead of a belt, you just added a strip of blue material at the waist, between the bodice and the skirt. That would break it up a little bit anyway. But honestly, I think it's great.